13 AMP ELECTRIC 16 IN. MOWER is rated 4.1 out of 5 by 29. Rated 4 out of 5 by Bonitopia from Great all around mower! I bought this mower a few weeks ago when we moved into our new home. It has served us well here on our 1/4 acre lot. Super easy to assemble right out of the box, we hit the lawn running. Having a variety of settings made it easy for us to handle the first couple of times since the grass was pretty thick and high in spots when we got to the back yard. The mower is very light and easy to maneuver once you get the hang of working with the cord. Its also very easy to clean. Even my mother at 68 finds it very easy to use. It has been a little wet here in NC, so we haven't been able to use the bag yet. It mulches pretty nicely and we love the option to bag if needed. Glad I bought this one. 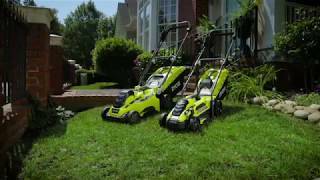 Rated 5 out of 5 by laidbak_bb from Exactly what I was hoping for I bought my Ryobi mower late in the season after my other mower gave out on me. I was excited to try something new and get an electric mower for the first time. I let my yard get a little thick while waiting for my new Ryobi mower to be delivered, so I had concerns that it would struggle. But I was wrong. This mower has plenty of power. Its super light and maneuverable. Its quiet and easy to store. Its exactly what I was hoping for. I love it. Rated 2 out of 5 by Joanne Harrison from Pro's & Con's I received this as a birthday gift last month. It stalls out if your grass is 6" long, so set it high and mow your lawn twice. I keep tripping over the extension cord as I have flower beds and shrubs to go around. I have a trimmer so that helps in the tight corners. There is a battery pack and charger sold separately, but its too expensive for me to purchase, so I have to put up with the extension cord. Pro's, its a pretty colour and light weight. Rated 5 out of 5 by Serzhoo from Lightweight but Powerful Since I bought this mower and started taking care of my lawn myself, all my neighbors are noticing the difference. I like the stylish look, the number of grass height you can select, and the fact that I don't have to change a battery or fill up the gas. After couple of mowing you'll learn how to manage the power cable: start from nearest point and go farther. Very very very easy to use, plug it in, push the button and go. Rated 4 out of 5 by Chris W G from easy to use, easy to put away. I like this mower, it cuts well, doesn’t bog down when challenged under normal cutting use. It also comes with a mulching plug which is a bonus and it folds up nicely and goes right on my storage shelf. The other thing I like is that it’s handles are long enough, I’m 6ft, no bending for me! Overall a good tool, i just wish it was a little heavier. Rated 4 out of 5 by Mindy from Love my new battery mower I got tired of my old mower being hard to start, needing oil, running out of gas, clogged air filter, etc. I decided on the 16” Ryobi mower because it uses the same e battery as MYS Ryobi blower,which I LOVE! This mower is also great. Starts easily and I was able to mow my whole yard on a single charge with some to spare. I am concerned about the flimsy plastic wheels though. Hope they last. Rated 5 out of 5 by MarkeK from excellent mower for small lawns I recently bought a new home with a small lawn. I researched many different types of mowers and settled on the 13 AMP Ryobi Electric 16 in. mower. I had it delivered to my home and it was easy to assemble. Took about 10 minutes. It runs well, cuts smooth, but does strain in longer grass. As long as I cut every week, I have no problems and don't smell like gasoline after mowing! 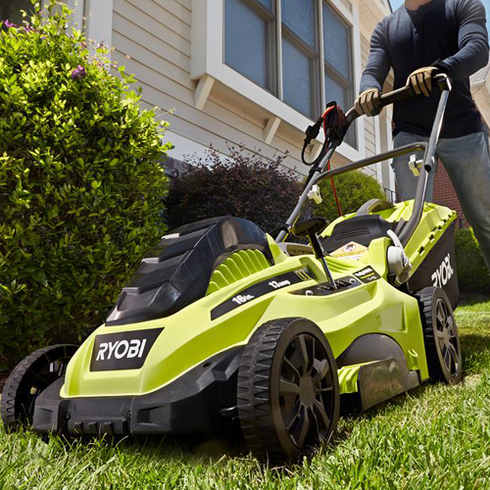 Go green and cut clean with the Ryobi 13 Amp 16 in. Electric Mower. An alternative to traditional gas operated mowers, this electric powered mower is environmentally friendly and maintenance free with no gas, oil, filters or spark plugs. This portable and light weight mower is just 32 lbs. and has collapsing handles for quick and easy storage The single point height adjustment allows you conveniently adjust the height of your deck from 1 - 2-1/2 in. Backed by a 3-Year manufacturer warranty.